Cypher2 is designed for deep sonic exploration and expressive performances. 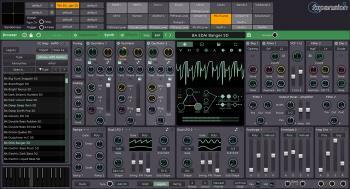 It features a vast range of sound design tools and over 1300 sounds, including 500 MPE-optimised presets. Experience a high level of expression through analogue-modelled oscillators, waveshaping and thru-zero FM. FXpansion's signature TransMod modulation system, now upgraded for Cypher2, ensures that every session with this premium synthesizer is a sound design adventure. Diverse library of 1300 expertly crafted presets (800 2D, 500 5D). Optimised for both MIDI Polyphonic Expression (MPE) and traditional MIDI controllers. 3 analogue modelled oscillators, FM and audio-rate modulation. Twin analogue modelled filters with 6 circuit models each. State-of-the-art 5D step sequencing & arpeggiator. TransMod: intuitive modulation for powerful sound manipulation. Scalable vector interface for retina/4K.